We believe that threading the barrel of the Mosin Nagant is the most effective method to install a muzzle brake on your Mosin Nagant because their barrel are not always concentric. See the picture above. 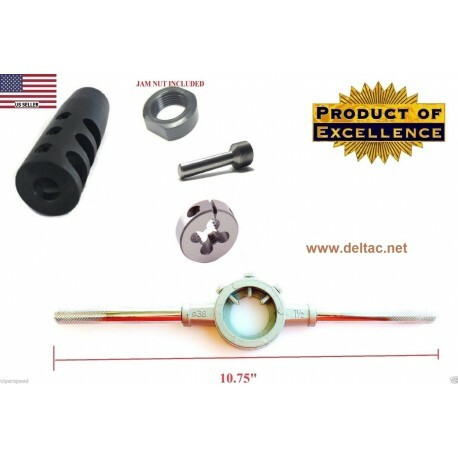 There are many breaks on the market that just mount with a bracket secured behind the front sight that end up being shot off with an exiting bullet and are potentially dangerous. Threading your barrel with the use of the enclosed threading tool insure your thread are true and are permanent but ensure reliability and accuracy. We also suggest this to be done by a gunsmith. This is a simple TAT (thread alignment tool) for re-threading 7.62 caliber muzzles to accept the above M15 X 1 RH muzzle device. The extended 3" long stem helps with *Mosin-Nagant barrels which have been counter-bored to renew the muzzle crown.. This a heavy duty #5 die handle is approx. 11.5in long and accepts 1.5in dia (38mm) dies like the M15X1 RH die that we offer on this site. The handle ends are not removable. These are high quality handles made of high tensile steel. pressure and rotate the die slowly. holder, and remove the TAT. to screw on by hand. and check the fit again. Repeat as needed. when all goes smooth, or a disastrous, aggravating, mess if you try to rush. NOTE: This device should be installed by a competent gunsmith to ensure concentricity and clearance at exit hole. First time purchase and attempt as a hobbyist gunsmith. This tool was all I expected. Easy to read/follow instructions. I would definitely recommend. The kit was complete, well made and very easy to use. The finished product is clean and the brake is very effective. I have cut the barrel back to 23.5 inches and re-crowned it, I had to open-up the threading die a good bit to fit the shortened barrel and cut it a couple of times but it is clean and works perfectly. Clocked the brake so the jam nut was not needed. I recommend this product to anyone wishing to improve upon their Mosin at a very fair price. It takes little skill to do a great job.